Working Bob Dylan’s electric style into your wardrobe. Disclosure: This post may contain affiliate links to products that I recommend. When you click on an affiliate link to a product on an external website, I will receive compensation if you buy something. Thank you for your support. At the Newport Folk Festival in 1965, Bob Dylan did something bold : broke away from his folk roots & played his first-ever rock set live on stage. This was radical, as many had hailed him as the definitive symbol of folk music, & all of a sudden, he was transitioning away from what he’d always been. Reinventing himself. & that, I believe, is one of the most inspiring things about Bob Dylan : the way he confidently became something entirely different & didn’t give a damn what folk purists thought of his decision. He did what he wanted to do & what he thought was cool. This was the beginning of Dylan’s “Electric Phase”, which spanned from 1965 all the way until his motorcycle accident in 1966. This is perhaps my favorite of his fashion eras, because this was when Dylan wore a uniform of suits, skinny pants, Chelsea Boots, untamed curls, & Ray Ban Wayfarers. Dylan, in this phase, was undeniably cool looking. Undeniably sleek, with a splash of rebellion & a lot of class. 1. Black or White Dress Shirts. Any neutral colored dress shirt will work. Dylan wore dress shirts extensively during his electric phase, mostly under blazers & with skinny pants. I love adding dress shirts to outfits when I want to make them look sleek + refined in some way, & I find them very comfortable. Wearing a dress shirt is a great place to start & will add a nice, classy touch to your electric ensemble. 2. Polka Dotted Button Down Shirts. 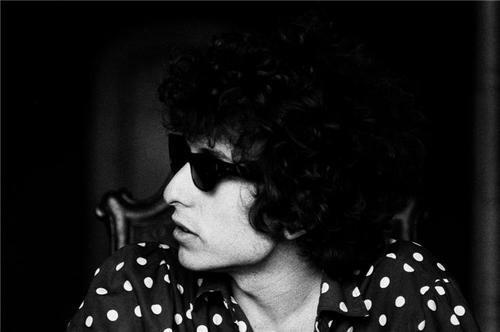 In some photos from the mid-60’s, Dylan wore a black & white polka dot shirt, similar to the one on the left. The larger the polka dots, the more retro & therefore authentic it will look. You could also wear a white & black polka dotted shirt like the one on the left, because it stills captures the sleek vibes this outfit radiates. 3. Skinny Trousers / Skinny Jeans. Black or other dark-colored skinny jeans or pants will work excellent for this outfit. Skinny pants look SUPER GREAT with heeled boots, as pictured below, & plus, they’re highly versatile & can be worked into pretty much any outfit, so if you don’t already have a pair, you should think about getting some. A good pair of skinny pants will look casual when you need them to, but can be dressed up for more formal occasions. As mentioned in Part I, you could also wear a dressier pair of shorts like these Dickies shorts or these Style & Co twill shorts for your outfit, depending on the weather & your preferences. 4. Black Skinny Blazer. Bob Dylan in most photos from this era could be seen wearing a blazer, both on stage & off. There is a lot of great footage of his utilization of blazers in Don’t Look Back, the documentary about his 1965 tour. Blazers are another one of those go-to basics that I think everyone should work into their wardrobe, in whatever cut & color suits your personal style the best. Adding a blazer to this outfit makes it look instantly classy. It makes you look like a cool, important person, & it looks sleek as hell. As you can see, Dylan’s wardrobe during this phase consisted of a lot of great basics. 5. Chelsea Boots or Riding Boots. I love Chelsea boots because they look very, very polished & chic, but also add a more rugged touch to an outfit. They have a medium but sturdy heel, something I love to see in a shoe. Wearing heeled shoes makes you taller & therefore can add a special air of confidence & badassery to your outfit (especially if they’re shiny & leathery like these), & a solid, sturdy heel means that you can still run/jog if you feel like it, without falling over. Which is always a plus. 6. Ray Ban Wayfarers. The iconic sunglasses of Bob Dylan. Other rock stars of the time, such as Roy Orbison, also frequently wore the Wayfarers, but no one made them look as cool as Dylan did. Wayfarers are THE choice in epic & badass sunglasses. Legend has it that putting a pair on makes you instantly look ten times cooler & will help you win friends & influence people. Kidding (kind of), but seriously, Wayfarers are a timeless classic & have that rock star look to them which glams up whatever you wear them with. Obviously the actual Ray-Ban version is nice (pictured left) but you can find inexpensive knock-off ones (right) which look pretty much the same & cost under $10. 7. Leather Clutch. Any kind of leather purse in a chic design & a bold neutral color or pattern will look great with this outfit, but there is something nice about these leather clutches that just goes with the minimalist theme of this look. Because clutches are small, they won’t overpower the rest of the outfit or make you look too accessorized. A clutch in black looks sharp, but I also like the checkered one, because the pattern of it reminds me of the houndstooth jacket pictured below. 8. Houndstooth Jacket. 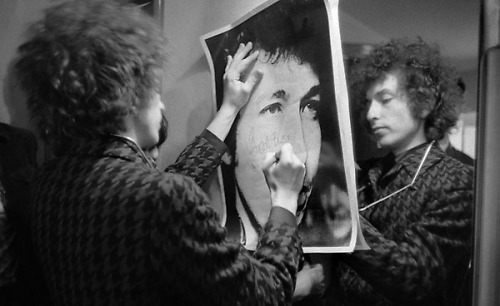 Dylan wore a houndstooth jacket in multiple photos from 1966, like this one and this one. Houndstooth tends to look more old fashioned than some patterns, but if you wear it with the right outfit, it can look classy & modern. 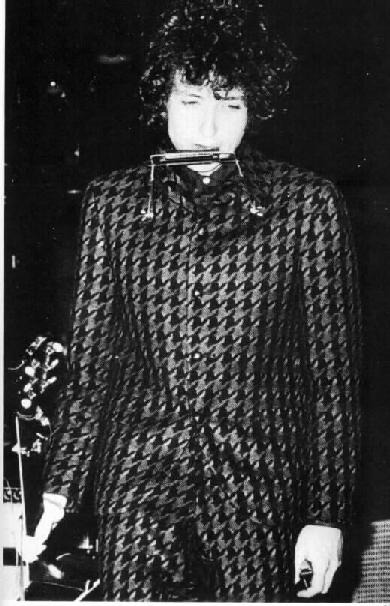 If you’re not feeling the retro-jacket thing, go for a houndstooth accessory, like the scarf featured above (which, I must note looks exactly like the one Dylan wears on the cover of Blonde on Blonde) or a houndstooth purse. 9. Suit Vest. Classy & sleek, & when worn without a suit jacket, classy-casual. Dylan wears a vest like this in the iconic Subterranean Homesick Blues video. Suit vests are another piece of clothing that I love the look of. Wear the vest unbuttoned over one of the aforementioned neutral colored dress shirts, & then pair it up with a pair of blue jeans & the Chelsea boots to match his outfit in the music video perfectly. For some more inspiration, here is a video of him playing Maggie’s Farm at the Newport Folk Festival in 1965. Read How to Dress Like Bob Dylan, Part I: Folk Phase.